Yet another early morning found we booking the coming nights stay in the small town of Vik. Leaving the hostel in Reykjavik before 7am I was on my way back up the South East coast to hit some things that I hadn't done previously. 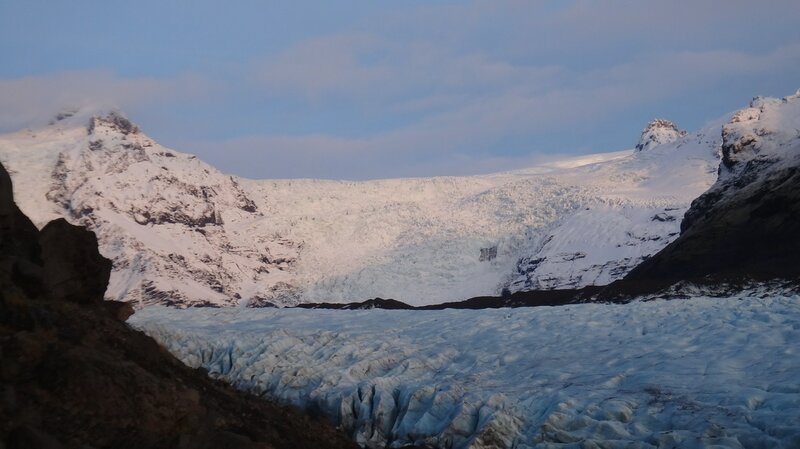 First off I got my glacier walking on with a morning trip to Solheimajokull. This is considered the easiest part of the Myrdalsjokull Glacier tongue to reach, I head up in a light rain. Strapping on my crampons and gripping my trekking pole in my right hand and ice ax in the left, I headed up for some easy and awesome views on the ice. Groups with their guides in the lead lined up a few hundred feet away from me to ascend unto the glacier proper, but I was content to hand out for an hour and wander around the lower ice. With snow coming down and the rest of the day's adventures anxiously awaiting me - I once again jumped into trusty Jeep and headed up to the rock formations at Reynir off the coast near Vik that I had seen previously from Dyrjolaey. With incredible waves and nice examples of Basalt columns stacked on the shore like sleepless guardians of the Icelandic shoreline, it was a nice morning if a bit brisk - with temperatures dipping into the mid 30's. Without further distraction - I continued Northward to see the much talked about Jokulsarion Glacier Lagoon of floating Icebergs that break off from the Breioamerkurjokull Glacier in the Skaftafell National Park that abuts Vatnajokull Glacier - taking up 14% of the land mass of the entirety of Iceland = A HUGE GLACIER. After almost 4 hours of driving - I was not disappointed by my effort. Glass crystals of ice bobbed and gurgled in the tidal lagoon, as pieces slowly made their way out the small river into the ocean - I spent about an hour taking in the views and enjoy the sights. Svinafellsjokull was next on my list, as I had passed it on my way to the lagoon - I knew that this short hike out to get close to a glacier. Packing up my running pack once again I took a nice goat path along the side of a mountain leading into the glacier proper. Again - solo and without cell / emergency backup service of any kind... I turned back about 1000 feet from actually walking the glacier, and the steep scree on the mountainside and the minimal hours of remaining daylight didn't encourage anything more than setting up my stove on a rock overlook and drinking hot chocolate while listening to the cracking and creaking of the ice, as it creeped its way along toward the water - continually having gravity pull it away from its birthplace somewhere deep in the heart of the glacier unknown ages ago. With darkness settling in, I drove to Vik and spent a nice evening at the HI Hostel in the town.